The sand at Texas A&M University – Corpus Christi was no match for Nika, an 18-month-old Labrador. Nika sniffed out two containers of oil, which will help aid in oil spill cleanup. Nika likes to play with her Kong toy. And she knows just what to do to get it. But first, the 18-month-old Labrador has to sniff out crude oil. When she follows her nose to find the oil she alerts her handler, Paul Bunker, by sitting down where she detects it. Bunker said Monday was a very different training day. 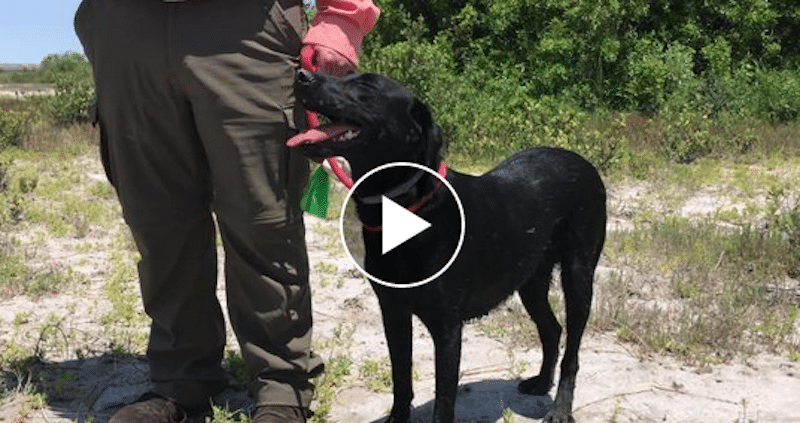 Bunker and Nika traveled from San Antonio to Texas A&M University — Corpus Christi to demonstrate Nika’s tracking. It was the first time Nika had tracked for oil on sand. The sand proved no match against Nika’s nose, as she found two glass containers of oil with no trouble. “The object of these dogs and the university is we can respond to spills and provide research,” Bunker said. Before the demonstration, Bunker gave a presentation at the university’s National Spill Control School. There, Bunker spoke about oil spill history, data collection and the deployment of dogs after an oil spill. At the beginning of her training, Bunker said, it took Nika 15 hours to recognize the scent of hydrocarbon, a key component of oil. Then Bunker used positive reinforcement, including toys and food, when Nika found the scent. She was then taught to listen and follow Bunker’s commands. Last came practice and scenarios, similar to the scenario at the university. Dogs like Nika also cover more ground quicker than humans would. Nika, who will be certified as an oil spill tracking dog next week, can cover about 20 miles of ground a day, Wood said. Nika also covered areas of brush faster than humans would. Monday, she ran through wet sand faster than her handler did. “Statistically, dogs are almost 100 percent accurate,” Wood said about finding oil. Before she leaves Corpus Christi, Nika will take a trip to Mustang Island. Wood and Bunker hope Nika will venture out and find traces of oil there on her own. “As long as it’s in the air that dog’s nose can smell it,” Wood said.